Rome, September 8. A General Chapter cannot fail to return to the sources of the adventure that Francis began in Assisi. It was here that he, Francis, wished to gather in chapter his fraternitas, which had become numerous, in the valley around Our Lady of the Angels of the Portiuncula. 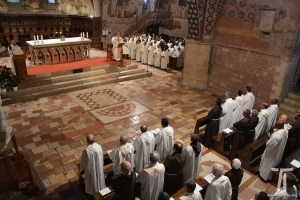 This General Chapter as well, like those before it, returned to Assisi this past Saturday morning, more than two hundred friars in all. This sea of Capuchin habits, arousing the curiosity of tourists and pilgrims alike, made its way through the streets of Assisi, arriving at the Sacro Convento where the remains of the Poverello rest. 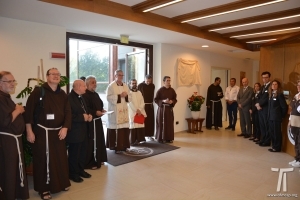 Our Conventual confreres welcomed the Capuchin friars kindly and fraternally at the entrance of the Lower Basilica. There, the solemn Eucharist began at 11 a.m. with the new General Minister, Br. Roberto Genuin, presiding. Given the circumstances and the place, the texts and prayers of the Mass of the Seraphic Father were chosen. After the proclamation of the gospel (Mt 11: 25-30), the Minister gave his homily in Italian, which was translated phrase by phrase into English. 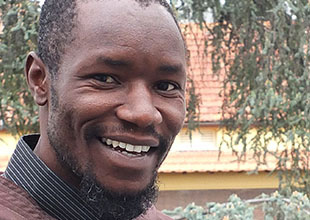 The emphasis was on Jesus’ prayer to the Father – “You have hidden these things from the wise and revealed them to the little ones” – and his words addressed to the disciples – “Come to me, all you who labor and are heavy laden, and I will give you rest. Take my yoke upon yourselves, for I am meek and humble of heart” – words fitting for those who have received the mission of service among their brothers. 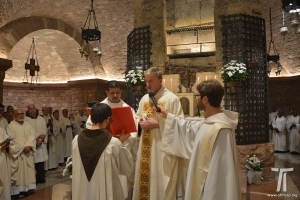 The Mass concluded before the tomb of St. Francis, in the crypt, where the Minister General and his Vicar renewed their profession of faith and pledged their loyalty to the Holy Church, the Supreme Pontiff and his magisterium, and to the bishops united in communion with him. 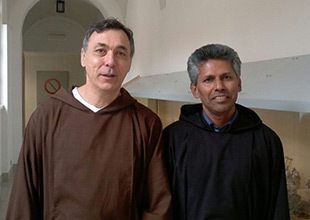 After this, the brother capitulars shared a lunch with the Conventual friars in the great refectory of the Sacro Convento. 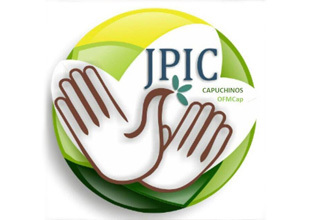 In everything there was an joyous and fraternal atmosphere. 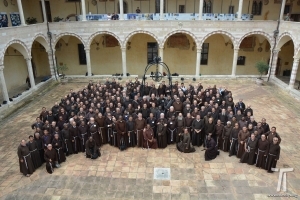 Immediately following, the pilgrimage day was immortalized with a group photo in the great cloister. In the afternoon, the friars gathered at the Domus Laetitiae, our beautiful retreat house, located along the road that goes up Mt. Subasio. 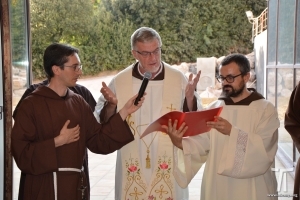 The house, rebuilt after the disastrous earthquake of 1997, was blessed yesterday evening in a celebration at which the archbishop of Assisi, Most Rev. Domenico Sorrentino, presided. 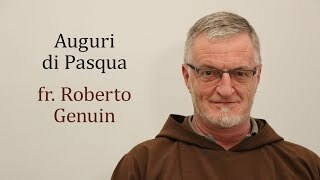 During Evening Prayer in the chapel, he spoke to the new General Minister and all the capitulars present, recalling to them his closeness to the Capuchins; Servant of God Francis Xavier Toppi, Capuchin bishop of Pompeii, was his spiritual father. 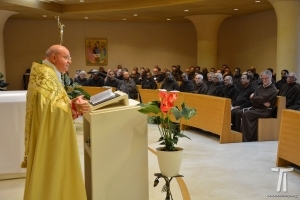 The archbishop also spoke on the Shrine of Renunciation, entrusted to the Capuchins that this gesture of Francis, renouncing even his clothing and recognizing only his Father in heaven, might be remembered. When Pope Francis visited Assisi he made a stop at the Shrine and said that Francis’s renunciation was not just about the Church of his time but also the Church of today, called to trust no longer in the apparent security of the world but to strip itself of all that weighed it down in witnessing to the Lord. After Evening Prayer, following a presentation of the house by the Provincial Minister of Umbria, Br. 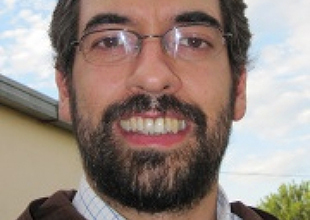 Matteo Siro, the General Minister blessed the new structure of the Domus Laetitiae.